He annihilated The Phantom Menace in 70 minutes. He lamabasted Avatar in 18. 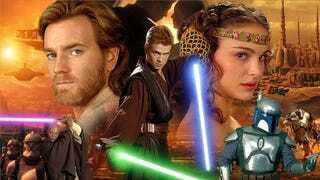 Well, Mr. Plinkett is back, and he’s set his crosshairs on Attack of the Clones with this epic, nine-part review. May God have mercy on our souls. Mr. Plinkett, the insane, Pizza-Roll-loving alter ego of Milwaukee filmmaker Mike Stoklasa, has returned to explain why Attack of the Clones is the worst movie in the world (he presumably forgot about The Phantom Menace after drinking his “magic potion” a.k.a. bleach). After his droll, Buffalo-Bill-voiced dissections of The Phantom Menace and Avatar, we’re ridiculously excited for this. Welcome back, you horrible old man. Part 2 - “So when they find out that you have a high midichlorian count in your bloodstream, I guess your parents give you to the Jedi as a baby to be trained in this creepy cult-like environment and you lose all your free will.” Who’s the only person in the galaxy who’s married? Jimmy Smits. Part 3 - His analysis of Obi Wan throwing himself out the window to catch the assassin droid is one for the ages. Thanks to Charlie R. for the heads up!